We’re delighted to welcome back Nonsuch Dulcimer Club to host another ‘Dulcimers at Halsway’! A practical workshop week combining 4 strands: mountain dulcimer with both an Introductory Course for beginners/improvers with loan instruments available, and a more in-depth Exploring Course course suitable for intermediate and/or advanced level players and advanced players of other fretted instruments. Introductory (beginners/improvers) and Exploring (intermediate/advanced) hammered dulcimer courses will run alongside this. Featuring superb tutors from the USA and UK, there will also be times to socialise and play informally, plus informal evening concerts from the tutors – and from participants! Hedre’s an outline programme from 2018 to give you an idea what to expect; we’ll post the 2019 programme in due course: 2018 Programme. Click here for the Nonsuch playing level guidelines. Participants – please complete and return this form. 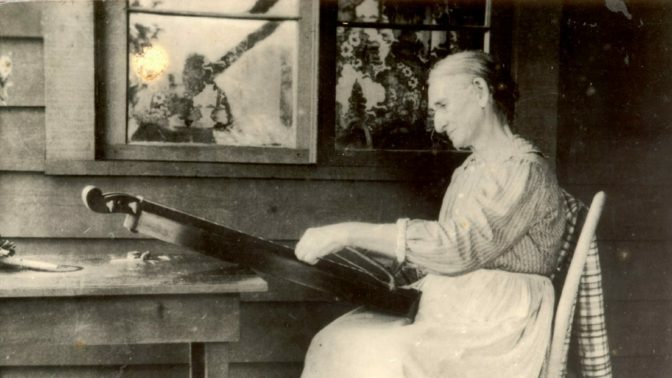 The Appalachian, or Mountain Dulcimer consists of three or more strings stretched over a long-fretted sound box, held on the lap and played by plucking or strumming. It derives from the family of fretted zithers found in Northern Europe and Scandinavia. Developed in the poor hill farming communities of the Southern Appalachians, the dulcimer was adopted by the early folk revival in the 1960s and rose to fame through its use by Richard Farina and Joni Mitchell, and groups such as Steeleye Span, Fairport Convention – even the Rolling Stones! Today a younger generation of acoustic musicians are discovering its distinctive tones and using it in fresh ways with traditional and contemporary material. The Hammered Dulcimer(HD) has a sounding board or box, typically trapezoid in shape, over which strings of increasing length are stretched. The strings are plucked or, more often, struck by hand-held beaters, commonly known as hammers. Its origins are lost in history but it probably came from the Far East a thousand years ago, before spreading across most parts of the world. It was a reasonably popular instrument in the UK before the advent of affordable pianos and until the mid-20th century still had a foothold in the pubs of East Anglia, Birmingham, Northern Ireland and Glasgow. It was re-discovered for a wider audience in the folk revival era, with players such as Sue Harris and Chris Coe featured in folk-rock supergroups the Albion Band and the New Victory Band. All skills levels will be catered for from beginners to advanced, in both Mountain Dulcimer and Hammered Dulcimer. We have Mountain Dulcimers available for beginners to borrow; if you need to borrow a Hammered Dulcimer we may be able to arrange this if given sufficient notice. Please make clear when booking whether you wish to follow the ‘introductory course’ for beginners/improvers or the ‘exploring course’ for intermediate level and above. Nonsuch Playing Level Guidelines 2016 – click to see a pdf of playing level guidelines. An International team from the US will be leading us through this workshop. Butch Ross, from Chatanooga, Tennessee, is a mountain dulcimer maestro who has played everything from Back to Radiohead, breaking through the supposed limitations of this humble Appalachian instrument. A patient, inspiring teacher, he’s also an in-demand performer, taking the dulcimer to new places. he needs no introduction to Nonsuch members. Rick Thum, from Missouri, is widely influential in the hammered dulcimer world, as teacher, performer and now maker. He brings a combination of passion and accessibility to his workshops and is equally happy at a late night jam. He is a favourite on the US festival scene. Thomasina Levy, from Connecticut is an award winning, internationally recognised mountain dulcimer player, singer, poet and song writer whose performances weave together the best of traditional and contemporary folk music. A former State Troubadour and now music educator she is well placed to discover the music that is in all of us. Matthew Dickerson, from South Carolina, was the 2012 national Hammered Dulcimer Champion and is now a successful and popular full-time musician, playing in a variety of styles and genres. he performs and teaches across the US and is now making his first visit to the UK.